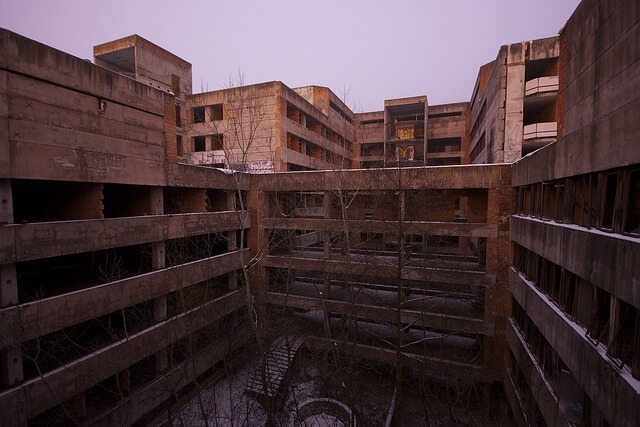 Searching for the most scary abandoned places in Bratislava, we visited the largest ruin in the city – Rázsochy hospital. Massive project to build all-fit-in hospital has existed since 1980’s, launching the construction in 1987. However, after 1989 the communist regime and its enthusiastic planning collapsed. For two decades, unfinished object serves only as a spooky monument. Permanently secured by safeguards with barking dogs and occasionally visited by paintball players, Rázsochy hospital remains one of the unexplored question marks of Bratislava hidden in the deep forest. On the 17th December 2010, during the excursion for students of geography at Comenius University, we interviewed a nostalgic guard who made an excursion into the politics of recent decades for us, but not into the object itself. Challenge to explore indoor areas of this spooky construction remains our task for the next season.